The HSM 2018 is a monthly historical garment challenge. Every month in 2018 will feature a themed challenge. Sew (or knit, or crochet, or tatt, or embroider, or milin, (or whatever it is you call making a hat), or otherwise create) a historical garment or accessory that fits the monthly theme. We’d love it if you did all 12 challenges, but how many you complete up to you. Push yourself and participate in all 12 challenges, do a half-marathon with 6, or just pick and choose the ones that fit your sewing schedule. Your HSM 2018 item can be as basic or elaborate as you want, from a simple fichu to fill in the neckline of a gown, to a full ensemble from the undergarments outward: whatever you need and can can handle time and skill-wise. For the purpose of the Historical Sew Monthly, ‘historical’ is Pre-WWII and earlier, so no later than 1938. Of course, for many periods making a garment that is identical in every respect to a period garment is basically impossible. Even getting close can be quite expensive and physically demanding, which isn’t possible for everyone. Ultimately, the level of accuracy is really up to your needs, skills, and resources, as long as the item is in pursuit of greater historical understanding. There are also many ways to consider accuracy (you may find my post on how I approach it interesting), and we hope that the HSF will get people to think about accuracy, and how our relationship to what we wear and how we make it has changed over history. You can start your project as early as you need to get it done in time – it doesn’t have to be made from start to finish in the challenge month. However, as the HSM 2018 is meant to encourage new creations, your challenge item should be finished no more than one month before the challenge starts. (so the Feb Challenge can be an item finished Jan 1, but no earlier, etc.). Note that this is finished, not started, so you can start a project as far before a challenge as you wish. Feel free to blog about the process of making your project, or use the HSM 2018 as an excuse to finish a UFO/PHd that you have already blogged about. Challenges are due by the last day of each month. The moderators will be doing blog posts featuring the makes they found most inspiring for each month’s challenge. Only items finished and posted within the month’s deadline will be eligible for inclusion in the Feature Posts. However, we know that life sometimes derails the best planned outfit, so you can still add your item to a Facebook album or blog about it months after the challenge ends. Challenges finished within the deadline do tend to get the most attention and comments. The other moderators & I will post pages with inspiration for each challenge, perhaps with a tutorial or links to helpful sites. These posts will be linked through each challenge (below) and shared on the FB group for the Historical Sew Monthly. Join the Historical Sew Fortnightly group on Facebook. The HSM 2018 challenges are listed as events, and you can choose to ‘attend’ them, chat with other attendees, get ideas, encouragement, and work through difficulties. When your item is done, you can post photos in the album for each challenge, give a description, and link to an online photo album or a blog post if you have one. You MUST answer the questions in order to join the Facebook group. 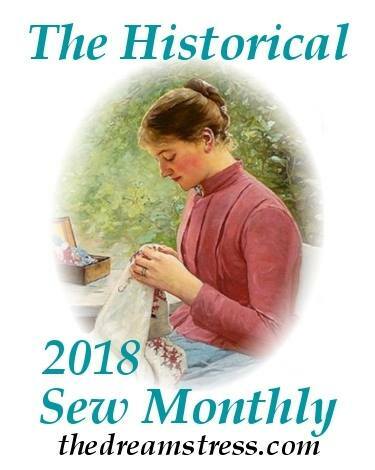 Participate through this page for the Historical Sew Monthly 2018 on my blog. Leave a comment with a link to your blog to let us know you are participating .Grab the button below and post it in your sidebar. Be sure to link it to this page.With WordPress your html will look like this: <a href=”http://thedreamstress.com/the-historical-sew-monthly-2018/”><img src=”http://thedreamstress.com/wp-content/uploads/2017/12/HSM-2018-w250.jpg”></a> (unless, of course, you save the image to your computer and re-upload it, in which case your image address will look different). Participate on Instagram! Follow @thedreamstress, and tag me in your finished item posts using #HistoricalSewMonthly2018 and the monthly challenge hashtags suggested with each challenge. I’ll share your finished images on my account. Feb: Under: Make something that goes under the other layers. March: Comfort at Home: Make something to wear around the (historical) house. April: Buttons and Fastenings: Create an item where the closures are the star of the show. May: Specific to a Time [of Day or Year]: Historically, some garments were worn year round, and for a range of events. Others were exclusively for certain times of year, or specific times of day. Make one of the latter. June: Rebellion and Counter-Culture: Create an item that pays homage to fashion rebels and clothes that flaunt their place on the fringes of standard sartorial society, or that was signature to a rebelling cause. July: Sleeves: There are some amazing examples of historical sleeves styles out there. Put the focus on the arms and shoulders in your creation for this challenge. August: Extant Originals: Copy an extant historical garment as closely as possible. September: Hands and Feet: Create a fabulous accessory for your hands or feet. October: Fabric Manipulation: Take fabric to the next level with any kind of historical embellishment or manipulation: smocking, shirring, embroidering, beading, pinking, ruching, printing, painting, dyeing etc. November: Purses and Bags: You’ve got your arms covered in July, your hands in September, now make something amazing to dangle from them. December: Neglected Challenge: Was there a challenge this year (or, if you’ve been doing the HSM for a while, in a previous year) you missed? Or didn’t create quite what you’d wanted for? This is your chance to make it up! Excited for another year of challenges! I’ll be categorizing all of my entries at https://dawnsdressdiary.wordpress.com/category/historical-sew-fortnightly/ and am already brimming with ideas for this year! Thank you to the moderators! Looking forward to the new year of HSM! I’ll be doing a selection of the challenges, and posting them on my blog. What a truly marvelous group of moderators! 🙂 Looking forward to another year! Tempted … would clothing for others qualify? I’m a jeans and t-shirt person, but the challenge is interesting. lesartsdecoratifs.frSigh …. Because I’m working on a doll outfit right now inspired by a 1907 Paul Poiret design. Tucks … teeny little tucks all over the place. I’ll come up with something. Alright…now that I have the blog post up, I can check in! Some exciting projects planned for the next year…plus the ones I never finished this year (although will likely become a UFO for a while). But a lot of my plans are still up in the air, and depend on finding a useable fabric in time. I’ll be trying to participate this year for the first time! My blog is over at: https://mxseamstrix.wordpress.com/ and I’m hoping to get a good chunk of the challenges done. I ended up derailed last year when my January sewing threw off my momentum, so I missed all the 2017 challenges (though I made quite a few things that could have fit the challenges), so I’m going to aim to do at least half the 2018 challenges this year if I can! 🙂 All would be better, I’ll do my best! Yay! Awesome to have you on board! I’m going to try to participate for the very first time! I’ve actually never sewn historical garments before, and am a pretty new sewer in general, so this will be a real challenge for me. I really enjoy dressing in an early to mid 1930s style, so that will probably be where I begin, but I’ve been itching to delve into some older historical periods so hopefully this will be a good place to start! Hello! I’d like to participate. My blog is at 18thcenturyboi.blogspot.com. I tried to participate last year, but my old blog was tied to my school email account, and when that email was deleted so was my blog! So here I’m having another go. I remember seeing this a couple years ago, but didn’t have time at the time. Glad to find it again, when I DO have a prairie dress that needs mending, and fabric washed for viking garb! Also a good opportunity to update my blog at http://rosehip.wordpress.com. I’m very excited to be participating again this year 🙂 Last year I was a new sewer, and only managed one challenge. This year I hope to attempt at least two! I am willing to challenge myself in this years Historical Sew Monthly. I felt I could last year, but a shoulder injury halted all attempts. Now that I am healed, no excuse but to take up needle and thread and begin stitching to my hearts content. I think it wise to say, start on a smallish manageable item first up, and gradually work up skills on doable projects, until ready to tackle a complicated garment. Otherwise the item will be discarded in the too hard basket and only disappointment to stop us participating…me in January last year! I will finish it later this year!! I’ve been sewing medieval clothing for many years now (and secretly following some of the previous editions of the challenge 😉 ) but I’ve started my blog just now. And I’m thriled to try the Historical Sew Monthly this year! I suppose I’m a bit late, but last minute I decided to get back into sewing, but had a couple questions. For those who have done it before, about how much money did you spend on fabric? Just a rough estimate. How much people have spent varies hugely, especially since the Historical Sew Monthly is global. Some people have worked entirely from their fabric stash, so have spent no money in that year. Some people have no stash, but have shopped very frugally, utilising op-shops and remaking things, and have spent less than US$100 in the 12 months. Other spend thousands. It’s really up to the person and their inclination and resources. I joined previously and got carried away with other projects and didn’t fulfil what I would have liked to do. Hoping I can use this to create some other interesting projects for me along with everything else going on! I need to change the button on my website to this years one yet! I saw an above comment that said no dolls clothes…may I ask why? I am very frugal with fabric and love to work in miniature–my model is an extremely articulated 2′ tall doll from Culture Japan’s Smart Doll line. She is advertised as a poseable photo and display piece as opposed to a toy, and resembles artist-quality BJDs quite well. At home, I am not allowed to sew anything for myself that I don’t have a good reason to wear. May I challenge myself to sew historical clothes for this doll, using your prompts, so long as I don’t a) claim to be doing your challenge (I’ll say something like “this is inspired by The Dreamstress’s HSM challenge”) or b) expect you to share my posts? My blog is centered around dolls and doll clothes, and doing my own version of HSM is exactly the kind of content I was looking to produce even before I found your blog. We don’t include dolls clothes in the HSF as a whole, because the requirements for sewing a dolls garment, as opposed to something that actually has to fit an irregular body, and move with it, are so different. Thank you! I didn’t see your reply but decided to post, on my blog, that I’m doing a “modified HSM” focused on dolls. Not that I don’t sew for myself…in fact I just set a record for speed–a late 19th century farm/work dress. I found out yesterday that I’d need it for work tomorrow (I work at a living history farm and am assigned to laundry tomorrow, so needed something less fancy than what I had) and I made it from start to finish today. Your concerns about lack of required mobility in doll clothes are valid, in fact I have been frustrated at the too-frequent need to adapt a garment for someone who just isn’t bendy enough to put things on the way people do. However, my designated HSM model is extremely articulate, so that’s less of an issue! Thanks again for the reply!